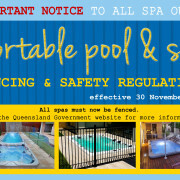 Portable pools and spas now need to comply with the pool safety laws. Children can drown in portable pools and spas—the water doesn’t need to be deep. The pool safety laws are aimed at stopping this tragic loss of life. From 30 November 2015, all pool fences and barriers must comply with current pool safety laws.